This article contains information about deleted or scrapped material; please edit as such. Resident Evil 1.5 / Biohazard 1.5 (also known as BIOHAZARD 2 PROTOTYPE) is the development name given to the first iteration of Resident Evil 2, which was scrapped in 1997. As the game was approaching its March 1997 release date, the developers were dissatisfied with the resulting product. Rather than releasing a game they were unhappy with, the developers took the risk of cancelling the game and developing the game again from scratch. Annette Birkin, Marvin Branagh, and Brian Irons in Resident Evil 1.5. Leon S. Kennedy - Leon's role in the game was that of a rookie police officer defending the Raccoon Police Station. Whilst on the roof, the infected enter. At some point he was to escape into the sewers with Ada and Marvin. Marvin Branagh - Leon's supporting character. Like Leon, he was a police officer defending the station from the hordes of Zombies and other B.O.W.s. Unlike in the final version, he was to play a much larger role and was to escape into the sewers with both Leon and Ada. Ada Wong - Another of Leon's supporting characters, her name was originally "Linda" early in development of 1.5, but was eventually changed to Ada. Linda may have just been a "working" name for development purposes. Her role is similar with Ada in the finished game, a double agent/spy working with Umbrella which at the same time is sent to retrieve a sample of the G-virus. She has the same mysterious and sassy personality with Ada in the finished product, except that she is a scientist. Elza Walker - Elza's role was as a college student returning to Raccoon City after a holiday. At some point, she joins up with John and Sherry where they plan their escape. Elza soon became Claire Redfield in the finished product. John - One of Elza's supporting character, known as "John" in 1.5. He is a civilian who seeks refuge in the police station and (possibly) locked himself in a cell to protect himself from the Zombies like Ben Bertolucci. He later became Robert Kendo in the final version of BH2. Roy - Another R.P.D. officer, role and scenario unknown but it is assumed his role was similar to that of Marvin. Judging from available footage, it seems he somehow had connections with John. [note 1] He is found in a small room and gives Elza the keys to John's cell. After rescuing John and returning to Roy, Roy eventually becomes infected and turns into a zombie, after pleading with John to end his life. Roy is eventually shot and killed by John. Sherry Birkin - A supporting character for Elza, Sherry would be pursued by William throughout the game. She was also an additional playable character as in the final version. These characters appear more or less in both protagonist's scenarios. Annette Birkin - The mother of Sherry and wife of William. Based on early concept art, Annette was supposed to also be infected with the G-Virus and mutate like her husband before her, though it's currently unknown whether this was supposed to occur later in the game or it's a concept that never made it past it's artwork. Brian Irons - Chief of the Raccoon Police Department. Unlike in the final version, Irons was a supporting character who would aid in Leon's story. Both his office and character are a lot less morbid in 1.5. William Birkin - The mutated husband of Annette and Sherry's father. After being infected with the G-Virus, Birkin wandered around the factory and has been encountered by both Leon and Elza, growling "Sherry". Crows and the Cerberuses share the same role as their Resident Evil 2 counterparts, with the dogs attacking the player in outside areas. This version also included a different breed of dog, as seen by the German Shepherd zombie dogs that would attack the player in the R.P.D shooting range. Web Spinners were supposed to hide in ventilation tunnels before attacking nearby enemies. William Birkin was to be far more monstrous, able to kill other infected creatures. As evidenced by the little known footage available of the game. 1.5 William would also mention Sherry's name multiple times during his search for her. In the prototype, the zombies were significantly more gruesome and tougher, continuing to crawl towards the player even with their body below the waist severed (it's possible for this to occur in Resident Evil 2, however enemies can only be blasted in half with the Shotgun and it's harder to pull off). It was also possible for a zombie to continue walking and attack the player even though its head was blasted off. However, once the zombie grabs the character, they would push it off and will immediately fall to the ground. In addition, the Zombies were able climb on and jump off ledges and get up from crawling, which isn't featured in the final version. The various types of zombies were far more varied, including fat zombies, black zombies and multiple female zombies. An Alligator and small crocodiles were also featured in the huge tunnel area in the sewers, where a fight presumably were to take place, similar to the final version. Two notable enemies in this version which never made it into the final version were a human/spider hybrid and Infected Gorillas. The Raccoon Police Station was originally conceived with a more modern look; in the release version, it was changed to being an old building re-furbished by the police as a headquarters. To find examples of older buildings, the team snuck into a mansion in Japan to take photographs, deciding that it would be easier than flying to the United States and back. If this version of the game and scenery were released, it may have effected future sequels such as Resident Evil 3: Nemesis (Biohazard 3: Last Escape) which was initially a different spin-off game, while another unrelated BIOHAZARD 3 title was in development in 1998. 1.5 is shown to have had a wide range of weapons at Leon and Elza's disposal. 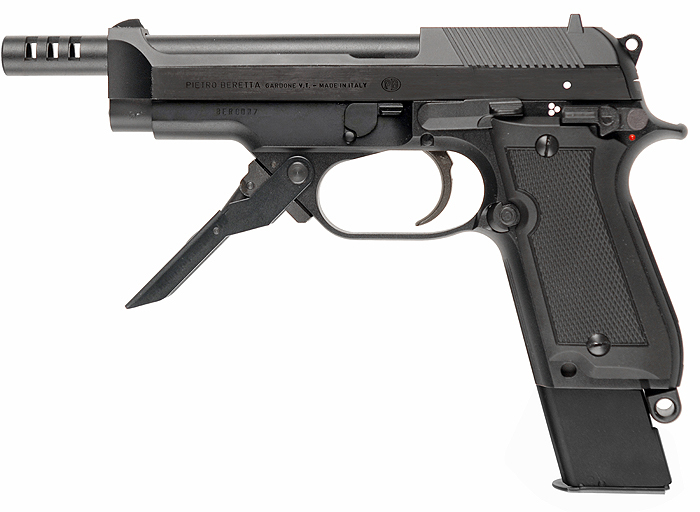 Originally, Leon's starting handgun was to be the Browning HP, a weapon that was one of the R.P.D. 's standard sidearms. 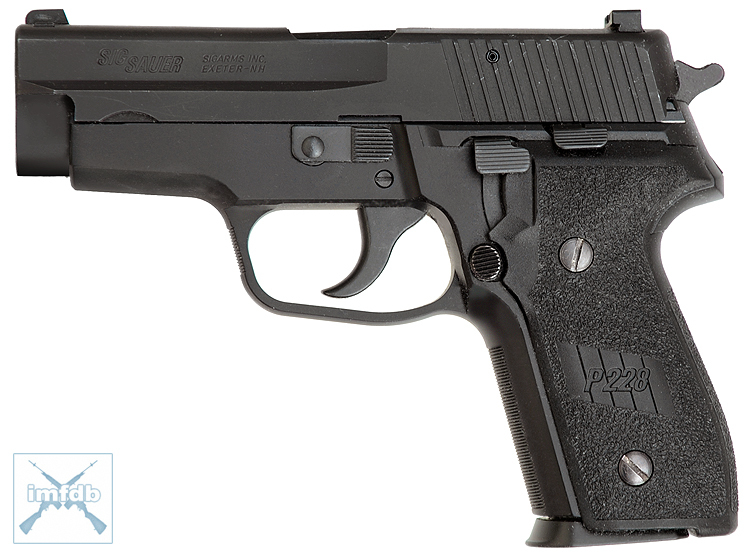 Elza's starting handgun was to be the Sig Sauer P228. Additionally, both Leon and Elza were originally both set to have burst fire handguns later in the game. 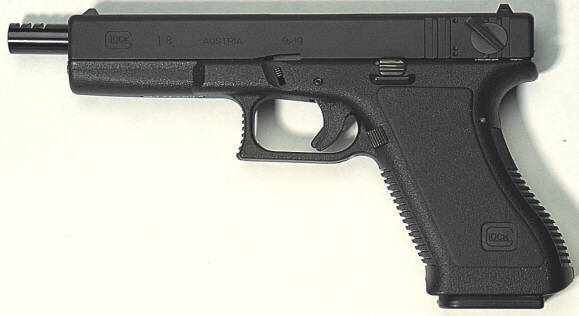 Both the Beretta 93R & Glock 18 though it is unknown which guns would've went to who. The Remington 870 could be used by both Leon and Elza, and judging by videos, the shotgun model was to to be full length, resembling like it did in the first game, but was later changed to the shorter version that was featured in the final version. The SPAS-12 that was fitted with a plastic stock, shot in semi-automatic & more powerful than the Remington 870 was set to be another shotgun and it was intended to be used by both characters. Hand Grenades were also set to be in the game, a weapon that was most likely exclusive to Leon as Elza had the Grenade Launcher. In addition, the Grenade Launcher was to have the standard buttstock rather than a pistol grip seen in the final version. Like the rounds in the Grenade Launcher, Leon was able to utilize Frag, Napalm and Acidic Grenades. The M202 FLASH was also set to make a return from the first game and was to be used during the climatic final showdown against William. The Flamethrower was also a returning weapon and was available to Leon that was to be found in a locker in the factory. The weapon did in fact make it in the final version, but was relocated to the Laboratory. A metal pipe was set to be second melee weapon in the game, which had longer range of attack and did more damage to enemies than the Combat knife. A Ruger Super Redhawk was set to be the game's magnum and was a weapon available to both characters. The MAC-11 was to appear in the game, but it's design in the final release was slightly different, as its barrel shroud was smooth instead of vented in the retail version of the game. The HK51 was set to appear and was supposed to be the game's assault rifle that was to be used by both characters. It did more damage than the MAC-11 and was (possibly) to be unlocked after completion of the game, similar to the Gatling Gun from the retail version of the game. Lastly, the Colt Python was set to return from the first game, and by it's description, it was the very same one used by Barry and urges the player to "handle with care!". The gun (supposedly) did more damage than the Super Redhawk, which would make it the second most powerful weapon in the game (behind the Rocket Launcher). It is currently unknown how the player would obtain this weapon, though it's speculated the player would have to complete the game under certain conditions, much like the HK51. The icon of the SPAS-12 was recycled and used for the game Dino Crisis, as the version with stock of the shotgun. ↑ Though officially named Roy, his italicized Japanese Katakana name "ロイ" may have looked like "DJ", which was a common mistake among fans. "ロイ" literally translates to Roy. Scrapped and cancelled Resident Evil projects. Resident Evil 2 (GBA) • "Resident Evil Outbreak File 3"